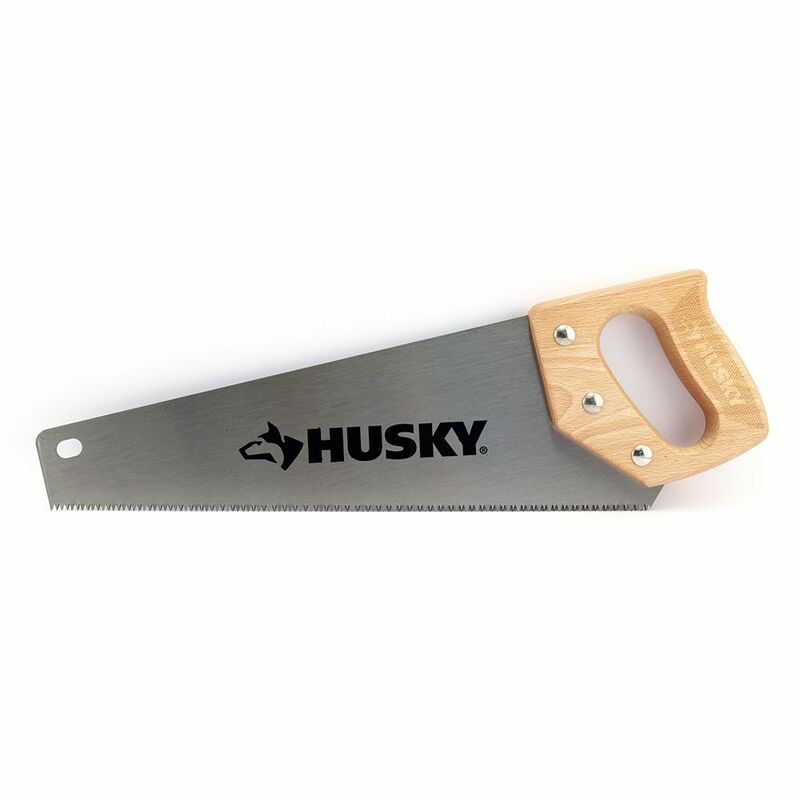 The Husky 15 in. Wood-Handled Aggressive-Tooth Saw features hardened teeth with a tri-bevel design to tackle the toughest cutting jobs. The large handle size is designed to help lessen fatigue when cutting. Constructed of precision ground and set teeth for smooth and accurate cutting. The tri-bevel tooth design is to help provide more efficient cutting. The blade is constructed of high carbon steel for strength and durability. The heat treated teeth provide longer life. The Dewalt 20 in. Hand Saw with Blade Armor is great for framers, general contractors and woodworkers. This sturdy saw features induction-hardened teeth that stay sharp for a long time, and low-friction, long-lasting Tough Coat coating for less drag. The new DEWALT hand saws, with their flexible blades, slide into places power saws will not reach such as when cutting dowels, drywall, shims, trim, moulding, and more. The saw blades are also heat-induction treated for long blade life. The DWHT20216 features a flexible blade for easy, flush cuts. The FatMax PVC Saw has a unique tooth design which significantly reduces burring, enabling the user to switch between cutting and connecting much faster. Also for use specifically with fine finish, plywood and hardwoods, this saw is designed for precise cutting including dovetails, miters, and tenons. Designed for the professional, this saw is built to provide long-lasting performance and handle the harsh elements of the jobsite. The Pro Miter 14 in. Backsaw features a spring-steel reinforced backing to help provide straight cuts, and the blade's precision-set teeth help offer cutting efficiency. Great for cutting hard and soft woods such as maple, oak, pine and others used in mouldings and trim applications. Use with a miter box (not included) to produce accurate and smooth angled cuts. 15 Inch Aggressive Tooth Saw The Husky 15 in. Wood-Handled Aggressive-Tooth Saw features hardened teeth with a tri-bevel design to tackle the toughest cutting jobs. The large handle size is designed to help lessen fatigue when cutting. Constructed of precision ground and set teeth for smooth and accurate cutting. The tri-bevel tooth design is to help provide more efficient cutting. The blade is constructed of high carbon steel for strength and durability. The heat treated teeth provide longer life.